Made with real chicken and real sweet potatoes, Artisan Inspired® Biscuits are all natural biscuits, handcrafted in small batches with all the savory smells you won’t find with other dog treats. Feed as a snack or treat as part of a healthy diet. 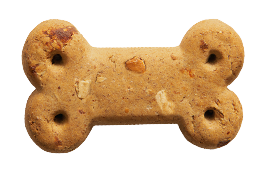 We recommend giving 1 biscuit per 10 pounds of your dog's body weight per day. Vita Bone® Artisan Inspired® BBQ Chicken & Sweet Potato Flavor Dog Biscuits are intended for intermittent or supplemental feeding only. Wheat Flour, Ground Wheat, Chicken, Wheat Mill Run, Dried Sweet Potatoes, Poultry Fat (Preserved with Mixed Tocopherols), Ground Flaxseed, Natural Flavor (Source of BBQ Flavor), Salt, Vitamin E Supplement, Rosemary Extract. BBQ Chicken & Sweet Potato Flavor Biscuits is rated 4.8 out of 5 by 62. Rated 5 out of 5 by Ruffinit from Picky eater approved & no fillers! Just returned from the store with the BBQ Chicken & Sweet Potato biscuits. My Maltese is SUPER picky, but loved these biscuits, and even asked for seconds! First, the biscuits are a good size, about 2.5" each. And my 16oz. Bag I counted 28 biscuits. Yes, I was excited, and counted! Turn over for ingredients...love! Love! Love! Ingredients are as if we baked these in our own kitchen. No fillers or weird sounding additives. So happy to have found you! Rated 5 out of 5 by Cindy63 from Favorite Biscuit by far! We currently have three dogs who are very spoiled and get lots of treats! But I have never found a biscuit before that all three absolutely love!! I keep a bag in my home office and I get visitors all the time hoping for a Vita Bone. My dog Lucy actually starts crying with excitement when I pick up the bag. They love all the flavors, but the BBQ Chicken & Sweet Potato is their favorite. Thanks for making such a great product!! Rated 5 out of 5 by Georgia Lynn from Dog crack My dogs are addicted to them. Guests have tried to eat them because they thought I had made them. That’s how fresh they smell. Georgia smells them out if I hide them, she begs for one before she will eat, go outside to potty, get in the car, see the vet! I literally have to make sure I have them or she will pout. I have a 119 pound golden retriever that could eat a bag a day if I let her. Rated 5 out of 5 by ptlvr from Sassy's favorite treat!!!!! My labradoodle, Sassy, seems to know the minute I bring the bag home that her favorite treat is here. She sits and waits patiently as I open the bag (with a smile on her face, it seems) and takes them in the other room one at a time to enjoy. She does not want to share them with her friend and cohort my cat, Mischievious. Thank you for making a healthy and enjoyable treat for Sassy. Rated 5 out of 5 by JHolden from Very picky eater dog eats them up! My dog is a very picky eater, annoyingly so. I try different treats every time I’m at the store to see what she will eat. I came upon these just before Christmas. I have bought them since! She loves them. She has tried, and loved, the Chicken and Sweet Potato & the Bacon Blueberry ones. Anxious to try some other flavors when they are available locally! Rated 1 out of 5 by Dadelion from Perfect For Any Dog Vita is the new favorite treat for my best buddy. When he sees the bag ears go up tail wags and then I hear that tiny little growl( witch is humorous because he is not so little). I so happy that I picked these up for him & very excited to try some of the other flavors Vita Bone has too offer. Thanks so much for offering a great quality product. Rated 5 out of 5 by Marley May from Special treat! I purchased the biscuits initially because of a coupon. My dog loved them. I decided to use them as a special treat for her in the car for when I take a drive. I used to stop at coffee shops and get a treat for ME and a homemade dog biscuit for her... at over $1 each! She likes the sweet potato/chicken better and they are a much better value.